Mix all the ingredients and let them rest in the freezer for at least 15 minutes. Serve with patacones or plantain chips. If you prefer a spicier ceviche, add 1 small jalapeño, diced. I love ceviche but... don’t get me started on this version with shrimp and watermelon! It’s really easy to prepare and it only takes a few ingredients. It’s a delicious recipe, ideal as a quick fix to delight your guests. It’s also a great option for those who don’t like or can’t eat raw fish because this recipe is prepared with cooked shrimp. 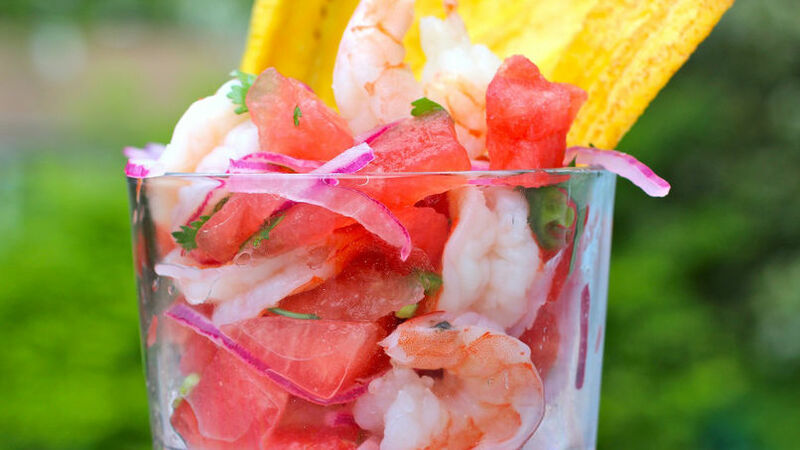 I love serving this ceviche with plantain chips or patacones. Serve as a snack in a party with friends or family. Buen provecho!